Amanda Nunes pulled off the biggest win of her career on Saturday night at UFC 232 when she slammed home a right hand that knocked out featherweight champion Cris Cyborg. The fact that it took Nunes just 51 seconds to accomplish what no other fight has ever done in the past 13 years was even crazier and now she stands alone as the only woman in UFC history to hold titles in two different weight classes. The win over Cyborg also likely put Nunes into another category all her own — albeit a more subjective one — as the greatest women’s fighter of all time. Of course there’s no way to definitively say that she stands alone now but UFC president Dana White says any argument to the contrary just doesn’t hold water. “She’s the best ever. How can you deny it? You can’t deny that she’s the best ever,” White said about Nunes at the UFC 232 post fight press conference. “That’s what this fight was for. This fight was to find out but if you look at her resume and who she’s beat, she’s the best ever. Nobody can dispute that. It’s tough to argue against White’s logic when taking a deeper look at the unreal resume that Nunes has put together during her career. She now holds wins against five current or former UFC champions in Cyborg, Ronda Rousey, Miesha Tate, Germaine de Randamie and Valentina Shevchenko on two occasions. Add to that, Nunes also holds a first round finish against Julia Budd at featherweight and she just happens to be the current 145-pound champion in Bellator MMA. With those kinds of high profile wins, it’s really difficult not to immediately had that ‘greatest of all time’ status to Nunes. Perhaps the scariest thing is that Nunes is only 30 years old, which means she still has plenty of time left in the sport to future secure her status as the best women’s fighter in history. 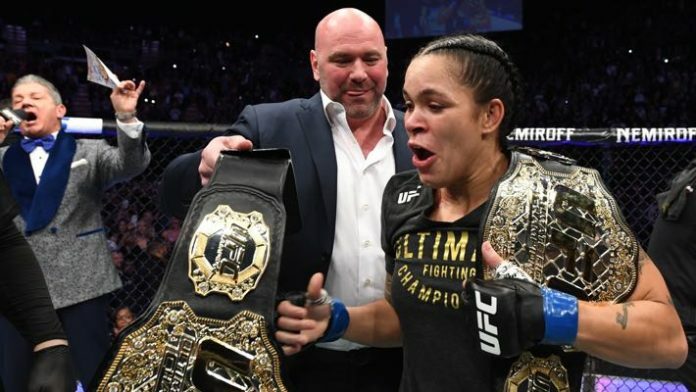 Is Amanda Nunes the greatest women’s fighter of all time? Sound off in the comments and let us know!